Thanksgiving was the day set apart from work by our forefathers to worship God, after they had gathered in their harvest, and it has been celebrated ever since their time. It is the occasion when Grandmothers, Grandfathers, Uncles, Aunts, Cousins, Brothers and Sisters gather together and have a good dinner of Roast Turkey and Plum-Pudding. I have generally dined at my Grandfather’s, but since he has been unwell and rather old, I have remained at home. I will give you an account of my last Thanksgiving Day. In the morning, I attended church and heard the Rev. Calvin Lincoln preach an excellent sermon. In the afternoon my Father, two brothers and I started on a walk to World’s End, which is more than two miles from our house, but we went to the point which made the walk about one half a mile longer. Solomon then loaded his gun and fired at a target, he also let Arthur fire at an old stump. We got home at about five and a half o’clock having been gone three hours. I therefore spent a very pleasant Thanksgiving. From our 21st century perspective, two things are missing from Lincoln’s essay. Football, of course, which did not yet exist in its modern form (see our prior post “A Schoolboy Fan of the Boston Game”), and any mention of the 1621 harvest dinner attended by the Pilgrims and the Wampanoag. The Puritan settlers of New England had a tradition of “providential” holidays: days of fasting called during difficult times for the community and days of thanksgiving called to celebrate times of plenty or deliverance from strife. In the years following the Revolution, the national government adopted this practice and held periodic thanksgiving holidays. The practice gradually became institutionalized, and in 1816 Massachusetts and New Hampshire were the first two states to establish late fall state holidays of Thanksgiving. 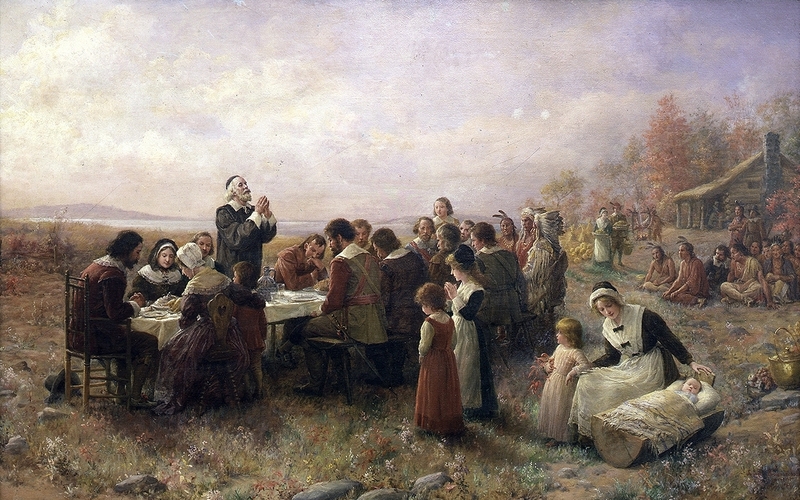 With the publication of Longfellow’s best-selling poem The Courtship of Miles Standish (1848) and the recovery of Governor Bradford’s lost manuscript Of Plimoth Plantation (1855), public interest in the Pilgrims and Wampanoag grew just as Thanksgiving became nationally important. 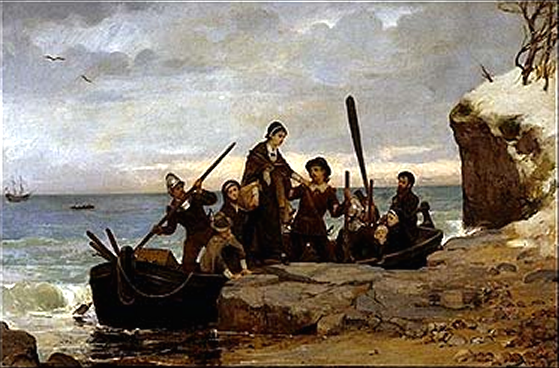 Until the third quarter of the 19th century, music, literature and popular art concentrated on the Pilgrims’ landing at Plymouth Rock and their first encounters with Native People on Cape Cod. . . . . The Pilgrims were not ignored in 18th and early 19th century America; we just did not always think of them and turkey dinners at the same time. In Plymouth, Boston, and other Massachusetts towns, dinners, speeches, parades, and other celebrations were held on December 22, the anniversary of the date in 1620 when the Pilgrims landed at Plymouth (having already spent several months on Cape Cod). Our archives include numerous copies of the speeches and sermons given, on what came to be called Forefathers’ Day, by South Shore ministers and politicians, as well as the occasional national luminary, such as John Quincy Adams (1802), Daniel Webster (1820), Edward Everett (1824), and Lyman Beecher (1827). Only after the Civil War and in the later years of the 19th century, did representations of the Pilgrims and the Wampanoag become focused on the “first Thanksgiving,” i.e., the 1621 harvest celebration. The story of the first Thanksgiving resonated in a country working to restore national unity and reacting to the increasing diversity of its population. This entry was posted in Uncategorized and tagged Derby Academy, food, Francis Lincoln, Lincoln family, Native Americans, Pilgrims, politics, religion, Thanksgiving.